Coming soon -- well . . . sometime in the mere future. Indies: The Ultimate Guide to Independent Record Labels & Artists by Norman Schreiber. It is a simple and handy access guide to some of the best music around. Explore the indies and find treasures of rock, folk, classical, world music , jazz, new age, and more. Acting as your curator, Norman Schreiber cuts through the thicket of independent labels and and presents the best, the most interesting, the most fascinating, the most unusual, the most noteworthy, the quirky, the sublime, the obscure. Many of these labels offer authentic, haunting, special, honest, startling, special, weird and/or creative music -- music that often becomes a deep part of the listener's life and psyche. Each entry includes the label's name and address, type of music offered, artist roster names, download sites, email address, business contacts and background information. 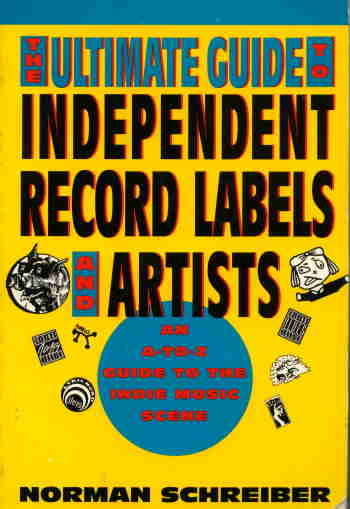 This book updates The Ultimate Guide to Independent Record Labels & Artists (pictured above), published by Pharos Books in 1992. The new edition will be published by Topquark Press as an e-book, a format that makes it even easier to use. In the meantime, the text of the original work is posted on this Web site. (See lnks at top or bottom of page above.). And if you want updates on the upcoming edition Just click right here, honey!